Will Metro Transit and the opt-out operators be posting ridership data from Super Bowl week? I'm interested in seeing ridership with the extra service. Also how did the Super Bowl LRT operations go? Besides the protest and long line for security check it looked like it went well. I am assuming we will be sometime next week. Yea I was at U.S. Bank Stadium helping with LRT Operations. Pregame went pretty smooth even though the protest because we had moved most of the Stadium Village customers to the game already. Blue line had some long lines at MOA, but people were happy to have an easy and quick service to the game. Post game we sent trains every 2 minutes out of US Bank, Blue on one side and Green on the other. Most people didn't have to wait in the cold for long, except for me, haha. I was impressed to see the tweet about regular train service being back before 10:30. Great job! Anyone else go to the Carver County Transportation Summit? I only saw the last 20 minutes when they were talking about Southwest LRT, Southwest Transit, and how autonomous vehicles will change transportation. Also got a pamphlet about the Southwest Corridor Transportation Coalition. Never heard of them, but it looks like their main goals are to widen Highways 5 and 212. Not sure how much that will improve safety and be an economic benefit for communities. Uh 5 and 212 aren't even anywhere near capacity? So idk how that would help? Or what would be the purpose? Then again, what ever is when you widen a road. Why aren’t we replacing all requests for more lanes with light rail? If people are making the argument that transit shouldn't be expanded with autonomous cars coming, why are we widening roads? Gotta love the anti-transit double standard in this country. Various updates pertaining to Green line, Blue line, Orange line, Rush line, rapid bus, etc. Very minor route changes coming March 17. Looks like 1 new trip added to the 19, 54, and 250. 1 trip eliminated from the 18. Minor time changes on other routes. Route 54 Extension details, documents are dated from September 2015. East Side frequency is better than the 61 but for some reason I thought it would be better than 30 minutes in non-rush hour. I am also surprised to see it's not stopping at Maryland Avenue. Geranium is two blocks away. It is describe as a "limited stop demonstration service" and is supposed to start on June 9. My understanding is this would require the reconstruction of the curb at the southeast corner of Maryland and Arcade St, which was delayed because of the Maryland Avenue 4-3 conversion test. I haven't heard anything on where that test stands. Do these guys have a reason to be idling while waiting to start their route? The first one has been idling for over 20 minutes when I took this photo. It's a beautiful day today so nothing about staying comfortable. This is at 2nd st s and 3rd ave s and is a regular occurrence. I'd send a message to MetroTransit and also hit them on Twitter with this photo! - Lake St stops (on 1st and Blaisdell) will only be served by the 535 and the reverse-commute trips of the 578 and 597. I do not like the idea of Uber or Lyft taking over Paratransit like Metro Mobility at all! "A percentage of that money helps defray the cost of our paratransit [service]," Makinen said. "So when you book a ride, you're paying it forward and helping your folks in your community with a disability. Which is pretty cool." I'd be all over something like that for the rare times I use a Lyft. 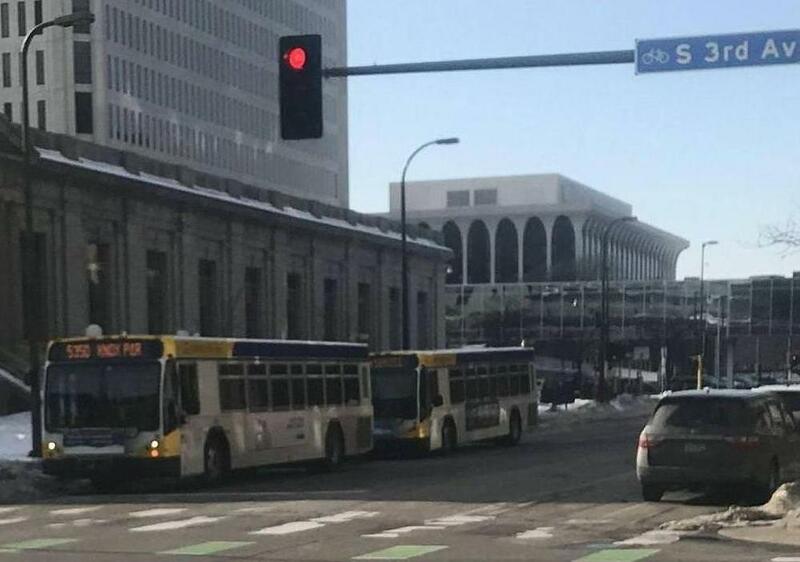 Hennepin Avenue to get pilot bus-only lanes between Franklin and Lake this spring. I wonder if they'll eliminate parking or the outer lane for this. Seems like a great idea, but I can already hear the howling. Do we really have to monkey around with this bus nonsense? There's supposed to be a trolley/tram there. Yes, we do need to monkey around with buses. They're vital means of transportation especially when given dedicated lanes. Buses can handle whatever volume of transit riders the corridor can produce. Prioritizing surface area to transit is the most effective use of resources to improve commuting for the area.